Accio, The Best Harry Potter Chess Sets! Step into the world of Hogwarts with one of these magical Harry Potter themed chess sets. Plus, a behind the scenes look at the iconic wizard chess scene from the first movie! Chess seems to be just as popular in the wizarding world as it is in our world, if the Harry Potter series is anything to go by. In fact, the game of chess is even integral to the plot of the series, since Ron bravely plays a game of wizard’s chess, sacrificing himself in order to let Ron and Hermione advance and stop Voldemort. Though wizard’s chess seems to have a bit higher stakes than muggle chess, anyone can have the thrill of a Harry Potter themed chess experience without putting their lives on the line with a Harry Potter chess set! A Harry Potter chess set is the perfect way to express your love of both the Harry Potter series and the game of chess by combining them into one enjoyable package. It’s actually a more popular combination than you might think! 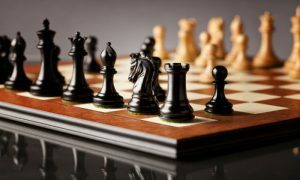 There are many different Harry Potter chess sets on the market in 2019, even so long after the books and movies stopped coming out, people remain highly invested and very interested in the world and its characters. Some of these themed chess sets feature characters from the stories as each chess piece, while others go a slightly different direction and model their pieces after the wizard’s chess pieces shown in the movie. If you’d like a Harry Potter chess set but don’t want it to be obvious to anyone who’s not also a Harry Potter superfan, the wizard’s chess sets can provide a simple nod to the series while still looking like a regular chess set on the surface. This Harry Potter chess set is the more subtle type. 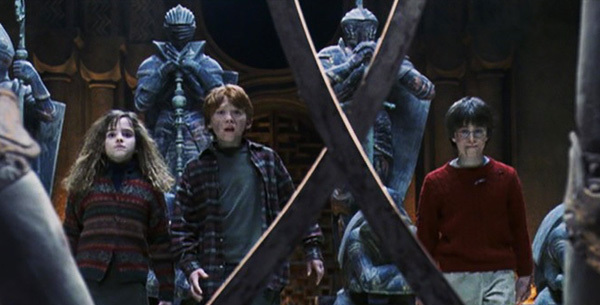 Its pieces are modeled after the actual larger than life wizard’s chess set pieces that are featured in the first Harry Potter movie. 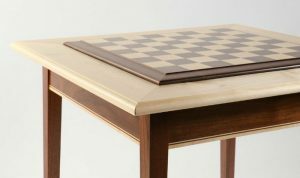 Luckily for those working with smaller spaces, The Final Challenge Chess Set by Noble Collection is shrunk down to fit onto a 20 inch square chessboard. Also, it doesn’t magically attack the captured pieces, so that’s a plus! Since we don’t have spells to be able to mend the pieces after each game, it’s better for the longevity of the set that the pieces don’t get smashed to bits during every game! 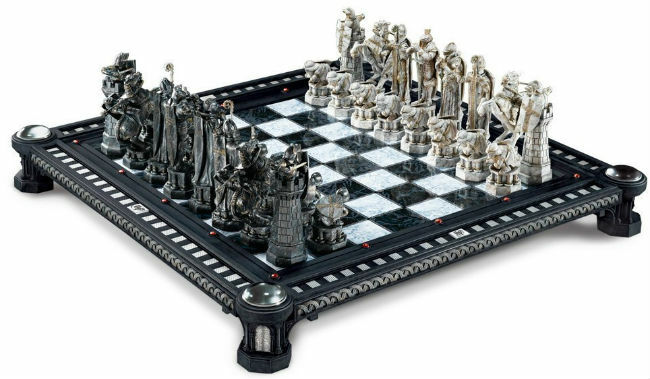 The pieces in this Harry Potter Wizard Chess Set are die-cast from zinc and designed to be an exact miniature recreation of the final challenge chess set from the first Harry Potter movie. 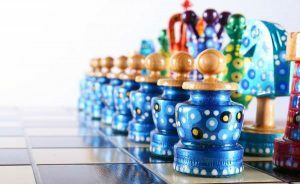 They are slightly oversized, with the pawns measuring 2.5 inches tall and the Kings measuring a towering 5.5 inches tall. Each piece is naturally weighted for a good balance, and they are actually quite hefty. 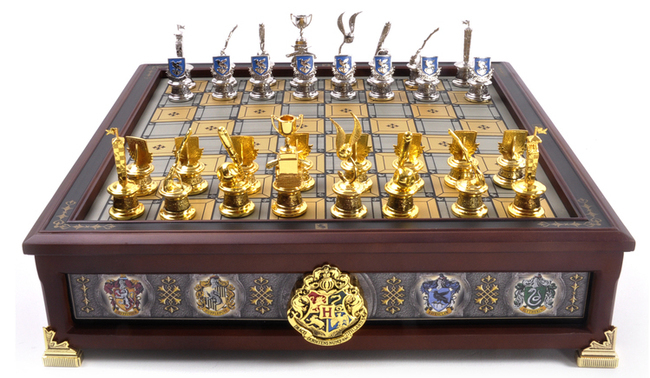 This Harry Potter chess set also comes with a matching 20 x 20 inch plexiglass chessboard. All together, it is an impressive sight! While this set is certainly a miniaturized version of the set from the movie, it is still pretty large. It will make for an impressive statement piece in any home, and fans will be certain to comment on it! This Harry Potter chess set is a beautiful collector’s item that lets you play as your favorite Hogwarts house. The Hogwarts House Quidditch Chess Set pieces are themed after each house – Gryffindor, Slytherin, Ravenclaw and Hufflepuff, and the pawns bear the banner of each house. The set comes with 4 complete sets of chess pieces in all, so that you can choose your favorite to play as. The pieces are die cast and enameled with each house’s signature colors. The pawns bear the sigil of each house. The rest of the pieces are modelled after recognizable Quidditch symbols, like a broom, a beater’s club, the golden snitch, and a trophy. The chessboard is a work of art by itself. 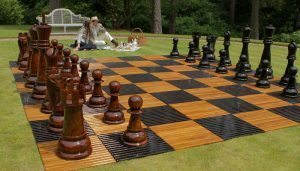 Not only does it include storage space for all 4 sets of Harry Potter chess pieces, but it is also made of high quality, ornate materials like solid hardwood and 24k gold. Each house’s crest, as well as the Hogwarts crest is emblazoned on the sides of the board in full color with gold plated accents. 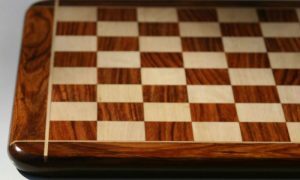 This chess set packs a lot of luxury into a tiny footprint, because it’s a very compact set, measuring in at just 12 x 12 x 3 inches. As a display piece or a functional Harry Potter chess set, this item really shines. The game of chess actually plays a significant role in the Harry Potter books and movies, right from the very beginning. Several characters are known to play wizard’s chess, including Gryffindor students Seamus Finnigan and Percy Weasley. Ron Weasley is also seen to be playing a game of wizard’s chess on several different occasions – he even beats Harry a few times! 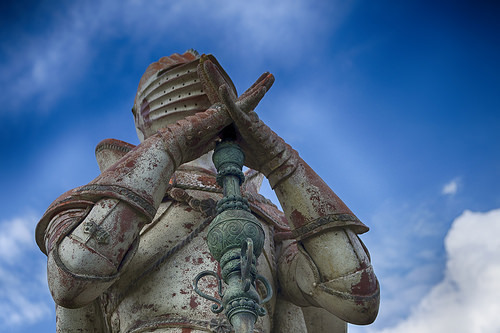 In the Harry Potter universe, chess pieces are enchanted to respond to the player’s commands, meaning there’s no need to pick up and put down the pieces, just tell them where you want them to go and they will. They can also remember past games you’ve played together and develop a certain level of trust for a strong player, as if they’re his own troops. Unfortunately, Harry finds out that the pieces can also have fun teasing players that they know aren’t as good, as he discovers when they begin to offer him conflicting advice as he’s playing with them. Hermione thinks that the game is brutal, since, in the books, the pieces knock each other unconscious and drag the bodies off the board whenever a piece is captured. Presumably, they magically repair themselves in the box and are ready to go by the next match. The game of chess plays a significant role in the Harry Potter books and movies. But, in the Harry Potter universe, chess is more than just a fun way to pass the time- it can also be deadly! Which is perhaps unsurprising, since many things that are completely innocuous in our world can be deadly in the Harry Potter universe, including willow trees, mermaids, staircases, and so much more. Hogwarts is a surprisingly dangerous place! Few Harry Potter fans can forget the dramatic chess scene that takes place in the first movie, Harry Potter and the Sorcerer’s Stone. It comes while our heroes are trying to make their way through the hazardous maze the Hogwarts teachers have put in place to guard the Sorcerer’s stone, a powerful magical artifact. After having made their way past a ferocious, 3 headed dog called Fluffy, disentangling themselves from a patch of Devil’s Snare, and chasing down a flying key, the young wizards find themselves face to face with the larger than life pieces of a giant wizard’s chess set! Having grown up outside of the wizarding world, Harry and Hermione aren’t familiar with the way the game is played, but Ron knows what he’s doing and takes control of the situation. The audience soon finds out that wizard’s chess is played very similarly to regular chess – only when pieces are captured, they get smashed to pieces by the piece that’s capturing them. Oh, and there is no directing from a distance; the kids had to get on the board and stand in for pieces that had been captured in a previous game, putting themselves directly in harm’s way! When pieces are captured, they get smashed to pieces by the piece that’s capturing them. 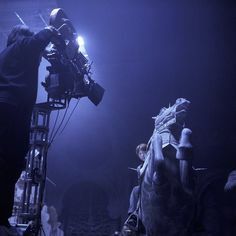 A lot of thought actually went into this larger than life wizard’s chess scene, and there was a lot of work going into it behind the scenes (apart from the construction of those giant pieces!) International Master Jeremy Silman was the mind behind the chess scene in the Harry Potter movie, and he is the one who designed the chess position we see on the screen and all of its subsequent moves. Unfortunately for chess enthusiasts, a lot of his moves were cut from the final version of the movie, which resulted in moves that didn’t seem to make much sense to those of us who are familiar with the rules of chess. The kids had to get on the board and stand in for pieces that had been captured in a previous game, putting themselves directly in harm’s way! Qxd3– This move prevents the King’s intrusion into h3 while satisfying the producer’s insistence that the first move of the sequence be a capture. This also puts Harry’s piece on a3 in some dramatic danger. IM Silman is coming on strong here, smashing a poor pawn to bits because he wanted to make the White Queen the villain of the scene and a piece to be feared. 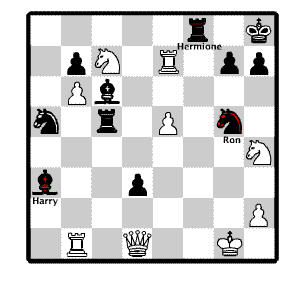 Rc3!– Ron’s first move is to sacrifice a Rook in order to free up the c5 square for Harry’s Bishop. Nh3+!– With this move, Ron decides to sacrifice himself instead of Harry, and simultaneously pulls the White Queen away from her control of the c5 square. Qxh3– Ron goes down! This is the only legal move for White. Bc5+- Harry moves into position, checkmating White’s King. QE3 Bxe3 mate– The final sequence was meant to end with Harry’s triumphant destruction of the villainous White Queen, but many of these moves were unfortunately lost in the editing process. A lot of details get cut out of the final product for the sake of expedience. This short scene was meant to provide a dramatic, tension filled mirror of the larger story, with all of its struggles and triumphs. Instead, it ended up as a scene that was over too quickly and left chess players scratching their heads. Of course, this sort of thing is to be expected whenever a book is adapted into a movie. The movie format just doesn’t have enough space within its story to explore ideas fully the way that a book does. They are limited by how long an audience can sit attentively in the movie theater at one time, and so a lot of details get cut out of the final product for the sake of expedience. Perhaps that’s the way things will always be. Of course, this chess scene was not described in such detail in the book, either. Perhaps it’s because J.K. Rowling didn’t have an International Master chess player consulting with her while she was writing her first book of a series that would, unbeknownst to her at the time, become one of the best selling children’s novels in history. If she had known that, or had the help of a chess professional on her side, she likely would have included more detail on the chess scene. We think IM Silman’s position would be the perfect addition to the book, though it may make non chess player’s eyes glaze over. The paired down versions of the chess scenes were certainly still dramatic ad enjoyable for people who are less familiar with the rules of chess. Since this was primarily a children’s movie, we can forgive the producers for not wanting to spend valuable screen time on a complex, metaphorical chess game that would likely go over the heads of the majority of their audience members. In the end, it was an entertaining scene, and now that we’ve explained the full context of the position, maybe we can all enjoy the scene a bit more. 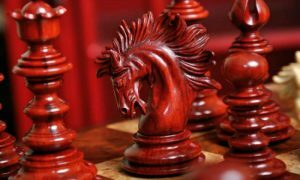 Chess-Sets: List of the Best Chess Sets of 2019. Hi. I am looking for the “collector edition” of harry potter sorcerer’s stone final challenge chess set which cost around $799 if not mistaken. Is it still available for purchase? Unfortunately, we are unable to find what you are looking for. 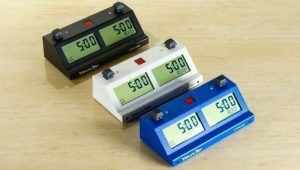 When the product you are looking for will be available in any online chess store, we’ll make sure to update our reviews!